Amazon.com description: Product Description: Following his blockbuster biography of Steve Jobs, Walter Isaacsonâs New York Times bestselling and critically acclaimed The Innovators is a âriveting, propulsive, and at times deeply movingâ (The Atlantic) story of the people who created the computer and the Internet. The Innovators is a masterly saga of collaborative genius destined to be the standard history of the digital revolutionâand an indispensable guide to how innovation really happens. Isaacson begins the adventure with Ada Lovelace, Lord Byronâs daughter, who pioneered computer programming in the 1840s. He explores the fascinating personalities that created our current digital revolution, such as Vannevar Bush, Alan Turing, John von Neumann, J.C.R. Licklider, Doug Engelbart, Robert Noyce, Bill Gates, Steve Wozniak, Steve Jobs, Tim Berners-Lee, and Larry Page. This is the story of how their minds worked and what made them so inventive. Itâs also a narrative of how their ability to collaborate and master the art of teamwork made them even more creative. For an era that seeks to foster innovation, creativity, and teamwork, The Innovators is âa sweeping and surprisingly tenderhearted history of the digital ageâ (The New York Times). 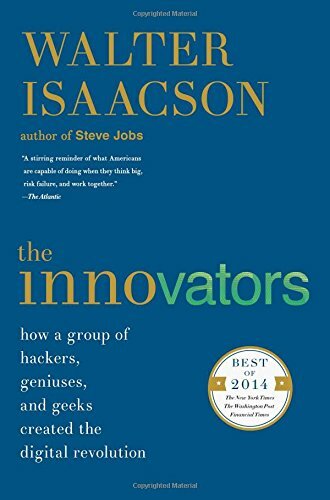 from Gardners Books (October 7, 2014); titled "The Innovators: How a Group of Hackers, Geniuses and Geeks Created the Digital Revolution"
About: Following his blockbuster biography of Steve Jobs, The Innovatorsis Walter Isaacson's story of the people who created the computer and the Internet. About: Following his blockbuster biography of Steve Jobs, Walter Isaacson’s New York Times bestselling and critically acclaimed The Innovators is a “riveting, propulsive, and at times deeply moving” (The Atlantic) story of the people who created the computer and the Internet. About: A revelatory history of the people who created the computer and the Internet discusses the process through which innovation happens in the modern world, citing the pivotal contributions of such figures as Ada Lovelace, Alan Turing, Bill Gates, and Tim Berners-Lee. About: Following his blockbuster biography of Steve Jobs, The Innovators is Walter Isaacson’s revealing story of the people who created the computer and the Internet. About: The Innovators is Walter Isaacson's revealing story of the people who created the computer and the Internet.